Ash-throated Flycatcher photographed by Robert Shantz at Carlisle Canyon east of Duncan, Arizona on May 5, 2003. Flycatchers, as their name implies, rely principle on flying insect prey for food. Winter is normally a season when such fare is in short supply. During the winter months in Arizona flying insects are not abundant, but are nonetheless present particularly near water courses. Chironomid midges and mayflies are the most common winter-flying insects in these areas. 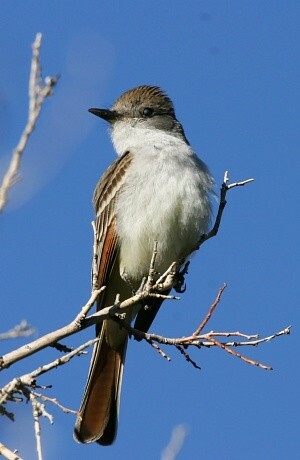 Ash-throated Flycatcher can be encountered in the Sonoran Desert all year round, but are most common in spring and again in fall. In summer the bulk of the population shifts north across western North America. Few are present in Arizona Dec-Jan when most have found insect-hunting better to the south in Mexico. In summer a very similar, heavier-billed, bird, the Brown-crested Flycatcher (Myiarchus tyrannulus) is more likely to be found in the Sonoran Desert. Habitat is canyons, rocky slopes and along riparian corridors.